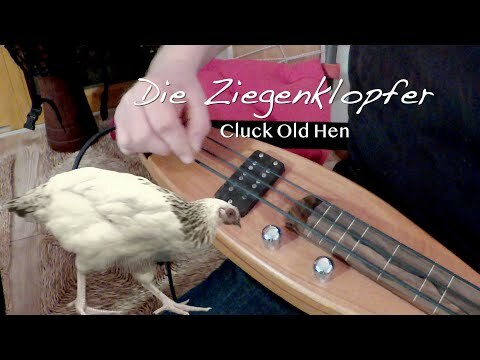 Die Ziegenklopfer spielen im Dulcimershop Ludwigsburg "Cluck Old Hen". In diesem Video ist zum ersten Mal der neue exklusive Dulcimus E-Bass zu sehen und zu hören! Ein Long Scale Bass aus Mahagoni, zwei Oktaven (eine Oktave bundiert, die zweite Oktave fretless), Griffbrett aus Ziricote, Häussel Cultom Humbucker, 3 Saiten DAD. Sonstige Instrumentierung: Dulcimer ( Dulcimer Konzertdulcimer ), Cajon, Big Bass, Waschbrett, Djembe. Many Thanks Terry and Diane for the great comments! OH MY GOSH! You guys are GREAT! Love it so much! GREAT!!! Triple wow wow wow. I love it! Gosh darn that brought smiles all around. Thank you Jan. Yes - this is true. The drums are "heavy". So i had to use my PickUp an a amplifier. We experiment here with many songs. For this sond we decided to do more "punch". You are having so much fun and it sounds great! You have an instant party when you all get together! I like the use of drums with this, but they make it harder for other instruments to be heard. Oh - Thank you Steven, Bob, Dan and Judith for your compliments. This video is way cool, Martin! Thank you all for for doing this! Wow - thank you Salt-Springs! The best......and that 2 octave bass really is amazing!!!! !